Has Saudi prince ushered in the real Arab Spring? WASHINGTON • Two weeks ago, Saudi Arabia's powerful Crown Prince hosted some of the world's leading investors at the palatial Ritz-Carlton hotel in Riyadh. Days later, Crown Prince Mohammed bin Salman, 32, upended the country's historical power structure by turning the hotel into a luxury prison and arresting, on grounds of corruption, dozens of the kingdom's most prominent princes and businessmen. Mr Faisal Abbas, editor-in-chief of pro-government Arab News, gave a Saudi perspective on the changes. "We need to understand that the days when things took too long to happen - if they happened at all - are forever gone. The exciting part is that thanks to the ambitious reforms being implemented we are finally living in a country where anything can happen," he wrote last Tuesday. Also striking a positive note was a Bloomberg commentary on Friday, entitled Saudi Prince's Revolution Is The Real Arab Spring. It noted: "He looks like a storybook Arabian prince and he talks like a progressive. He says he plans to liberalise and modernise his sclerotic society, expand the civil rights of women, reduce the economic power of the Saudi fossil fuel industry, and loosen the grip of the 5,000-member royal cousins club that has bled the country dry for generations. "Not only that: The prince also promises to transform Saudi Islam into a more tolerant brand of religion that does not fund extremist mosques in the West or underwrite jihadists in the Middle East. Isn't this the Arab leader we have been waiting for?" Other commentators were more cautious. The detentions on grounds of corruption - seen by some as a power grab by Prince Mohammed - have ended a system by which kings maintained stability in the world's largest oil supplier by parcelling out powers to different branches of the family, a Washington Post article noted. "The king was certainly first among equals, but power was shared," Professor Gregory Gause, a Saudi specialist at Texas A&M University, told The Post. •Lebanese Prime Minister Saad al-Hariri unexpectedly resigns in a televised speech from Saudi Arabia, saying he feared for his life and accusing Iran and its proxies of destabilising the country and the region. •Yemen's Houthi militias, embroiled in a war with a Saudi-led coalition, fire a ballistic missile at Riyadh's King Khalid International Airport. The missile is shot down by Saudi air defences. 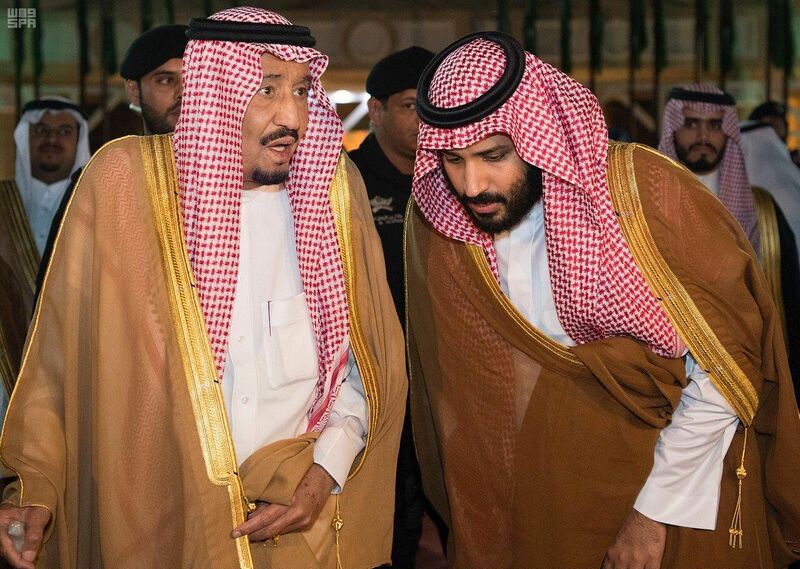 •Shortly before midnight, Saudi authorities arrest 11 princes, four ministers and dozens of former ministers on orders from an anti-corruption committee headed by Prince Mohammed bin Salman. •Lebanon's Iran-backed Hizbollah chief Hassan Nasrallah says Saudi Arabia is behind Mr Hariri's unexpected resignation. Iran denies arming Houthis with the missile. •Concerns rise that Lebanon will be a battleground for the Iranian-Saudi conflict. •The Saudi central bank is said to have instructed banks to freeze accounts of corruption suspects. •Attorney-General Sheikh Saud Al Mojeb says that those detained will have access to legal counsel and pledges to hold trials "in a timely and open manner". •Saudi Arabia says the Houthi missile attack could amount to an "act of war" by Iran and offers a US$440 million (S$599 million) bounty for intelligence on 40 Houthi rebel leaders. •Saudi Gulf Affairs Minister Thamer al-Sabhan warns Lebanon over siding with Hizbollah against the kingdom. •US President Donald Trump praises the Saudi sweep, tweeting he has "great confidence in King Salman and the Crown Prince of Saudi Arabia, they know exactly what they are doing". •Iran categorically rejects Saudi Arabia's "baseless and unfounded accusations and considers them as destructive, provocative and a 'threat to use of force' against a UN member state". •The US says it welcomes Saudi Arabia's "statement exposing the Iranian regime's support for Houthi militias, including the supply of illegal arms such as ballistic missiles". •Saudi crackdown widens. Some 200 princes, ministers and businessmen detained over alleged US$100 billion in embezzlement. •US Secretary of State Rex Tillerson warns "against any party, within or outside Lebanon, using Lebanon as a venue for proxy conflicts or in any manner contributing to instability in that country". "This system had the vices of committees - slow, ponderous, sometimes missing opportunities, conservative, risk-averse. But it also had the virtue of committees - cautious, avoiding major mistakes, checking impetuous decisions." Prince Mohammed's planned shake-up of the economy will rely heavily on his ability to break the entrenched power of the clergy. He has already weakened the religious police, announced plans to lift a ban on female drivers in June next year and called for a more moderate form of Islam. Saudi Arabia's Attorney-General Saud Al Mojeb has said that at least US$100 billion (S$136 billion)had been misused "through systemic corruption and embezzlement" over several decades but details are yet to be provided. The developments have made it easier for Prince Mohammed to pursue his plan to overhaul Saudi Arabia's oil-reliant economy and step up a regional power struggle against Iran, which includes a military offensive in neighbouring Yemen, a campaign to isolate Qatar and a warning on Tuesday against travel to Lebanon, whose prime minister's resignation at the weekend is seen by some as engineered by Riyadh. But the broad nature of the shake-up has unnerved some investors, The Post noted. "It isn't that they arrested senior princes that concerns international investors," Mr Crispin Hawes, a managing director at Teneo Intelligence, a political risk consulting firm in London, was quoted as saying. "Until there is some clarity on charges or possible penalties, investors don't know the risks of doing business with major Saudi partners." However, for some investors, the scenario presented upsides. Mr Sam Zell, chairman of real estate firm Equity Group Investments, told Bloomberg Television that the arrests were "long overdue" in a country that has been "in many ways resisting modernisation", and that he is personally more likely to invest there as a result. The prince is betting that support from a younger generation of Saudis hungry for government accountability and more social freedoms will offset potential threats from the enemies he is accumulating with each decision that strengthens his hands, said Mr Theodore Karasik, a senior adviser at Gulf State Analytics in Washington. "The sweeping away of the old Saudi order that ran the kingdom is a bold step with many unknowns," he told The Washington Post.